Crowned: Kingston-upon-Thames, 4 April 978. Ruled: March 978-December 1013, February 1014 April 1016. 38 years. Married: (1) c 985, Elgiva (c963-1002), dau. Thored, ealdorman of Northumbria: 13 children; (2) 5 April 1002, Emma (c 985-1052), dau. Richard, duke of Normandy: 3 children. Died: London, 23 April 1016, aged 48. Buried: Old St Paul's Cathedral, London. Athelred (Ethelred) is remembered colloquially and half-jokingly today as the Unready, although the nickname was really a clever pun on his name, athel "noble" and raed "counsel", meaning "noble counsel". Throughout his reign Athelred was ill advised and if he made his own decision, he was as likely to change his mind, hence the nickname, raed-less, or lacking counsel. He was a better administrator than history has given credit, but he was a hopeless king and leader. He was the son of Edgar and his second (or third) wife Elfrida. At the time of Edgar's death there were many who supported Athelred as the next king, but the witan elected his elder half-brother Edward. When Edward was murdered three years later, Athelred's supporters, who included his mother and the Mercian ealdorman Alfhere, ensured that Athelred came to the throne. He was still probably under ten, and Elfrida and Alfhere dominated the government of England. Alfhere had been the main opponent to Edward and led the anti-monastic movement, which flared up following the death of Edgar. Alfhere believed that the monasteries were becoming too rich and powerful too quickly and that they could control the shires. Alfhere was implicated in the murder of Edward. Interestingly it was he who translated Edward's body from its hasty burial at Wareham to Shaftesbury, where it was buried amongst great ceremony and talk of miracles. Alfhere remained the most powerful ealdorman until his death in 983. He succeeded in shaping Athelred's policy toward reducing the power of the monasteries, although Athelred later over-turned this. Alfhere also had to face the impact of the first Danish raids for thirty years, which marked the beginning of the end for the Saxon kingdom. When he died, Alfhere was not much loved, being regarded as something of a bully. After Alfhere's death Athelred endeavoured to exert his own authority and even his mother's considerable power waned, though she lived till 1002. There was a period in the late 980s when Athelred sought to reduce the power of the church, but he subsequently reverted to his father's interests and promoted the construction of new monasteries under the new order. He also endeavoured to update the laws of the country and reorganize local government. This culminated in the Wantage code of 997, which, compared to past law codes, showed an unprecedented willingness to accept local customs, especially those amongst the Danes of eastern England. Many of the odd and curious anomalies that we have in our customs and codes of conduct in this country were enshrined under this code. Had Athelred's reign been measured by his willingness and ability to reform and organize, he would have been remembered kindly, but his mettle was tested when the Danish raids returned and England was pushed to the limit. The raids began in a comparatively small way as early as 980 and continued through to 982. Most of the raids were in the south west, but Southampton was severely damaged and London was attacked and burned in 982. Raids ceased for the next few years and perhaps Athelred was lulled into a false sense of security, for in 987 they began again, once more in the south-west and then, in 991, a major battle at Maldon in Essex. The Danish leader Olaf Tryggvason outwitted the East Saxon ealdorman Beortnoth, and the Saxons were killed to a man. The first payment of danegeld, or what amounted to protection money, arose following this battle, a policy instigated at the suggestion of Sigeric, the archbishop of Canterbury, who was one of Athelred's poor advisers. Olaf used this ploy as he moved around the south and east, plundering and destroying and then extracting payment. In 994, after the Danes had invaded London, Athelred paid 16,000 pounds in danegeld, but this time on the basis that Olaf would accept Christianity and never again raid Britain. Olaf kept his promise. He used the money to strengthen his fleet and finance his bid for the kingship of Norway. But others who had made no such agreement superseded his command, and so the raids continued. Each year the danegeld increased until the riches of England were savagely reduced. In addition the monasteries were plundered and destroyed and with armies being kept mobilised for most of the year men were unable to harvest. The country grew poorer, the men weaker, and spirits lower. The men had no equivalent of Alfred or Edward (the Elder) or Athelstan to look to for leadership. Athelred had never been tested as a battle commander and he had no idea what to do. He also had to face desertion from amongst his own ealdormen, whose actions in fleeing the command of battle further weakened their men's morale. Athelred seemed powerless to punish them. Instead he shifted from one mad scheme to another, none of which worked and all of which reduced the country's morale further. At one point in 1009, he demanded that a whole new fleet be constructed, but he was unable to find sufficient able commanders and had no battle plans to meet the Danes in the waters they controlled. The fleet spent more time anchored off-shore than in battle, and once it moved into battle it was destroyed. Athelred did nothing to save it but left it to its fate. The venture was a disaster and drained the country's resources further. In 1002 Athelred married Emma, daughter of Richard, duke of Normandy. The marriage was almost certainly to create an alliance whereby Richard stopped the Danes using Normandy as a base for raiding southern England. Richard no doubt played his part, but the plan was another of Athelred's ineffective tactics. Probably his worst decision was the St Brice's Day massacre on 13 November 1002. He ordered the killing of every Dane who lived in England except the Anglo Danes of the Danelaw. It is unlikely that the edict was carried out to the letter, but there was fearful slaughter across southern England which left a bitter stain on Athelred's character. Even if the resident Danes had supported him previously, they now turned against him. The massacre brought back to English shores the Danish commander Swein who had accompanied Olaf on earlier missions. Legend has it that Swein's sister and her husband had been killed in the massacre and Swein returned to exact revenge. Swein's campaign lasted from 1003 to 1007 when Athelred agreed a peace treaty with him and paid over an immense danegeld of 30,000 pounds. Swein returned to Denmark, but new commanders took his place and the raids and slaughter continued. The next major enemy was Thorkell the Tall, who arrived with a major army in August 1009 and left a wave of destruction across southern England. The low point of this campaign was the murder of Alphege, the archbishop of Canterbury in 1012. Thorkell had not condoned the murder and he subsequently offered his services to help protect England. Athelred had to raise a new tax, the heregeld, to pay for Thorkell's army, but this band of mercenaries was more effective than the English army because it had a strong, sound leader. Nevertheless, the whole of England had now become a battlefield, and the English were prepared to submit. Swein read the signs correctly when he returned to England. He landed in the Humber in August 1013, and the Northumbrians immediately submitted, followed soon by the Danes of Danelaw. Athelred waited with Thorkell's fleet in the Thames off London, so Swein marched on Bath, where the Mercians and West Saxons capitulated. By December 1013 London collapsed and Athelred fled to Normandy. Swein died only three months later and Athelred was recalled, when Swein's son, Canute, returned to establish himself in Denmark. Athelred's return was conditional on that he governed "more justly than he had done in the past." Matters did not improve, however. 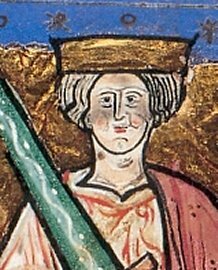 Early in the fighting against Canute, in 1014 Athelred's eldest son and heir, Athelstan, was killed in battle. Early in 1015 Athelred executed the two leading thanes of the Danelaw, whom he regarded as traitors, which did not endear him to Mercia or the north. His son, Edmund, gained the support of the Danelaw, and when Canute returned later in 1015, England was divided and the armies refused to move against the Danes unless the king himself commanded them. By now, though, Athelred was dying. Although he was only forty-eight, he had lived longer than many of his predecessors and was worn out by the fighting. He died on 23 April 1016, leaving Edmund to continue to battle for survival.